Prince Harry and Meghan Markle have been joined together as husband and wife in a ceremony marked by more than just a touch of British and Hollywood glamour. Following the ceremony, the newlyweds celebrated privately at a lunchtime gathering, before making their way to a private reception for 200 close friends and family at Frogmore House, hosted by Prince Charles. The couple made the roughly 1.6-kilometre drive to the evening reception in a classic Jaguar convertible. The car, a silver blue Jaguar E-Type Concept Zero, was originally built in 1968, but has recently been converted to electric power. The car bore the license plate E190518, the date of their wedding. Prince Charles, Prince Harry and Markle are expected to make a speech at the evening reception. Dinner is also expected to be served, although it’s not clear what’s on the menu. Guests headed to Frogmore House were given a few hours to freshen up and change outfits following the lunch reception. Both Harry and Markle made a clothing change before heading to the evening festivities. 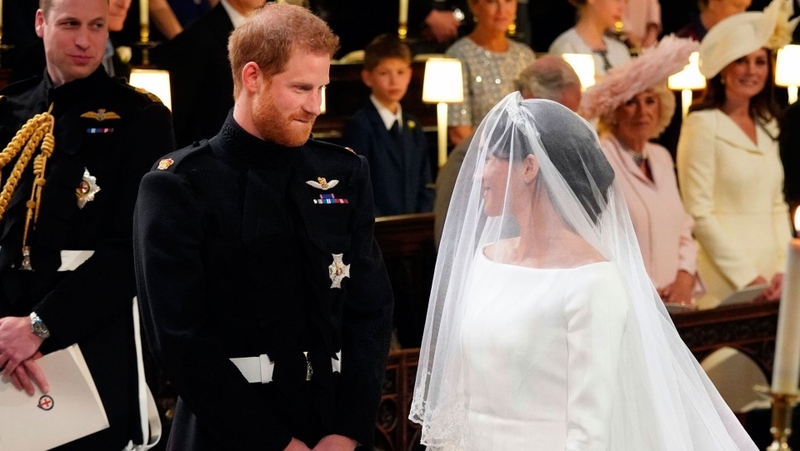 Harry went with a classic black tuxedo while Markle wore a bespoke “lily white” silk evening gown from British fashion designer Stella McCartney. 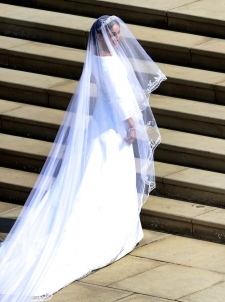 Markle chose to wear a simply adorned, silk wedding gown with three-quarter-length sleeves, designed by Givenchy artistic director Clare Waight Keller. Holding her bridal veil in place was a diamond-encrusted bandeau tiara lent to her by the Queen. As Markle stepped out of her Rolls Royce limousine, two of her page boys, seven-year-old twins Brian and John Mulroney, carried her long veil, wearing gap-toothed grins as a trumpet fanfare blared. The twins are the sons of Jessica Mulroney, a fashion stylist and close friend to Markle, and Ben Mulroney, co-host of CTV's "Your Morning" and anchor at "etalk." The boys’ four-year-old sister Ivy Mulroney acted as one of Markle’s bridesmaids. The Archbishop of Canterbury, Justin Welby, officiated while Michael Bruce Curry, the American presiding bishop of the Episcopal Church, delivered an impassioned address about the nature of love that quoted U.S. civil rights leader Martin Luther King. "There's power in love," Curry said during the ceremony. "Love can help and heal when nothing else can. There's power in love to lift up and liberate when nothing else will." As the couple exchanged their vows, Harry presented Markle with a wedding ring fashioned from a piece of Welsh gold given to them by the Queen. Prince Harry bucked royal tradition by also taking a wedding ring: a platinum band with a textured finish. The happy couple will now be known as the Duke and Duchess of Sussex. Queen Elizabeth has also conferred Prince Harry, sixth in line to the British throne, with the additional titles of Earl of Dumbarton and Baron Kilkeel. 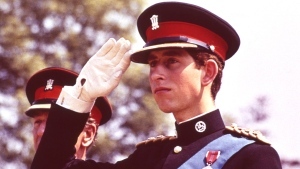 Ahead of the ceremony, Prince Harry arrived at the chapel by foot accompanied by his brother Prince William, both dressed in the dark uniform of the Blues and Royals with caps and white gloves. Queen Elizabeth, Harry’s 92-year-old grandmother, wore a citron suit and hat as she took her seat in the chapel’s quire. Accompanying her was the Duke of Edinburgh, whose attendance had been somewhat in question. Though the 96-year-old has been out of the public eye in recent weeks following hip surgery in April, he entered the chapel without any aids. Also in the quire were members of the Royal Family on one side, including Prince Andrew, the Duchesses of Cornwall and Cambridge, with Markle’s mother Doria Ragland, on the other. Many of the couple’s closest friends were nearby as well, including Serena Williams and her husband Alexis Ohanian, George Clooney and his wife Amal Clooney, and media mogul Oprah Winfrey. 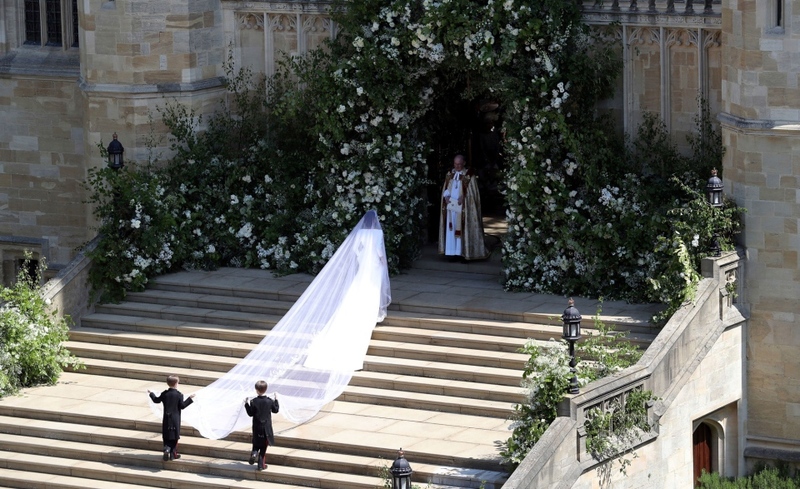 Several hundred more guests were seated in the chapel’s nave, including actor Idris Elba, singer Elton John, Victoria and David Beckham, with the men dressed in morning suits and uniforms and the ladies in hats and fascinators. Among Harry’s guests were several buddies from his decade of work with the military and friends from the charities he supports, which include veterans’ aid and mental health awareness. Outside the chapel on the grounds of Windsor Castle were 2,640 members of the public who had been specially invited by the couple, including charity volunteers, war veterans, and members of the royal households. 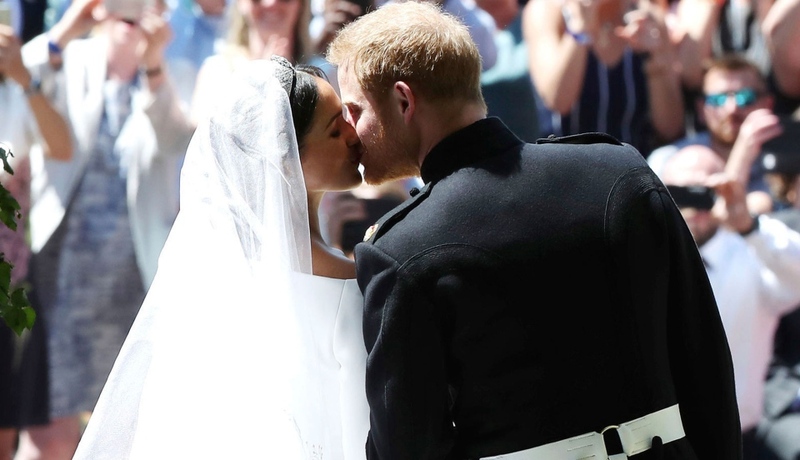 After the ceremony, the crowd roared their approval as Harry and Meghan emerged to greet them, growing even louder as the couple took a moment to kiss on the chapel steps. 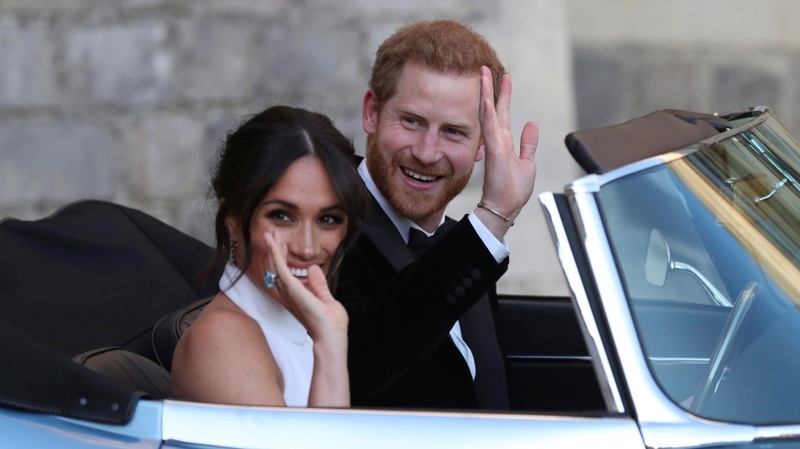 The newlyweds then stepped into a horse-drawn Ascot Landau carriage amid blue skies and sunshine for a procession through the streets of Windsor. The carriage made its way past the castle walls to weave through the town's narrow streets. 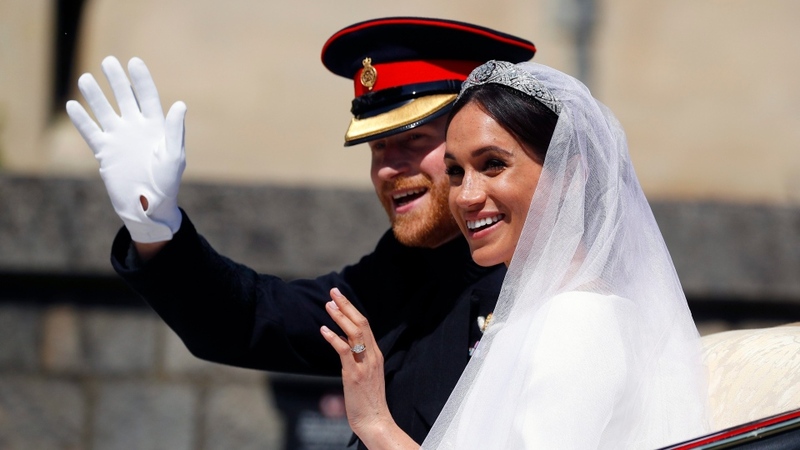 According to The Royal Borough of Windsor & Maidenhead, more than 100,000 excited fans greeted the newlyweds, some draped in Union Jacks, others waving U.S. flags or cardboard cutouts of the couple. Many of the guests hoping to catch a glimpse of the newlyweds camped out for days in hopes of landing the best spot. "I went to William and Kate's wedding, but this is a completely different vibe," said Arlene Prinsloo, who had flown from South Africa, told The Associated Press. "It's much more relaxed, and I think that reflects who Harry is." The wedding also proved popular for those who couldn’t make it to Windsor. British newspaper The Daily Telegraph estimates more than 1.9 billion people caught the wedding on television, globally. On hand throughout it all was a heavy police presence. Hundreds of officers armed with semi-automatic weapons and sniffer dogs patrolled the streets and castle grounds, while police snipers watched from nearby roofs, equipped with scopes and binoculars to survey the scene. Following the procession, wedding guests attended a lunchtime reception at St. George’s Hall in Windsor Castle, hosted by the Queen. The around 600 attendees were served canapes made from seasonal British produce, including Scottish langoustines, grilled English asparagus and croquette of confit Windsor lamb. The wedding cake, designed by Claire Ptak was given a special place of honour before being served. A light sponge cake, the filling was made from Amalfi lemon curd and elderflower buttercream, using elderflower syrup made at the Queen’s residence in Sandringham, and decorated with Swiss meringue buttercream and 150 fresh flowers. To drink, guests were offered Pol Roger Brut Réserve Non Vintage Champagne, and a selection of wines. For those not drinking alcohol, a selection of soft drinks and an apple and elderflower mocktail were on offer. The mocktail is made from the same elderflower syrup as the wedding cake. The reception also had entertainment, with Elton John performing for the couple and their guests. John, a close friend of Harry’s late mother, Princess Diana "performed for the newly married couple in recognition of the close connection he has with Prince Harry and his family," according to Kensington Palace. Following the afternoon festivities, the couple made their way to a private evening reception for 200 close friends and family at Frogmore House, hosted by Prince Charles. The newlyweds made the roughly 1.6-kilometre drive to the evening reception in a classic Jaguar convertible. The car, a silver-blue Jaguar E-Type Concept Zero, was originally built in 1968, but has recently been converted to electric power. It bore the licence plate E190518, the date of their wedding. The newlyweds were expected to return to their home in Kensington Palace in London on Sunday. They are not immediately embarking on a honeymoon and have their first royal engagement as wife and husband scheduled at Buckingham Palace Tuesday. A honeymoon is expected to happen soon, though. Harry is partial to travelling in Africa, so it's possible their destination may be somewhere there. After only two dates in 2016, they went camping together in Botswana. After the royal wedding, what's next for Harry and Meghan? Did the Queen commit 'brooch warfare'?